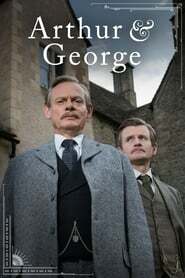 Arthur & George is a three-part adaptation of Julian Barnes' novel about Sherlock Holmes creator Arthur Conan Doyle as played by actor Martin Clunes. Set in 1906 in Staffordshire, Hampshire and London the drama follows Sir Arthur and his trusted secretary, Alfred ?Woodie? Wood as they investigate the case of George Edalji, a young Anglo-Indian solicitor who was imprisoned for allegedly mutilating animals and writing obscene letters.